Authentic cream gravy is one of those things that is uniquely Texan, although I understand it has an avid following in Oklahoma as well. Outside of Texas, people either don't know what you're talking about (cream gravy? ), or you get some bright yellow gluey substance that's just plain wrong. 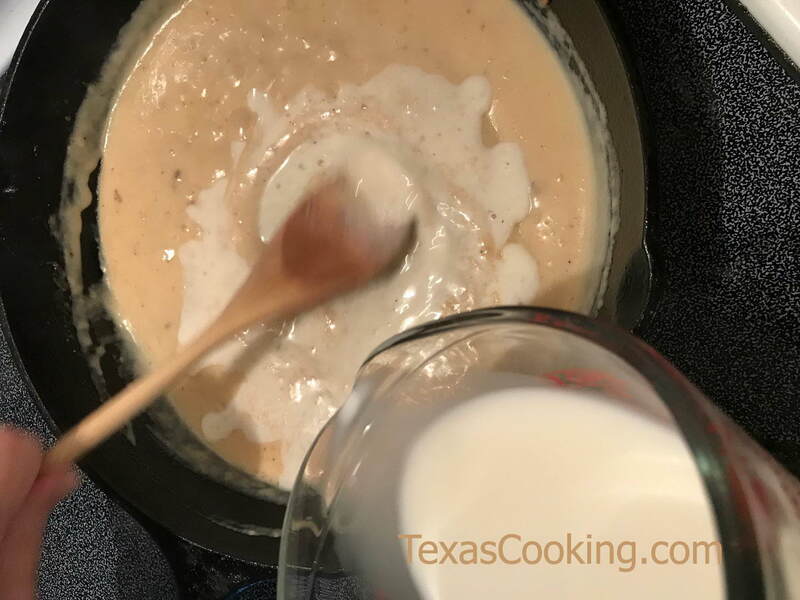 Cream gravy (or white gravy) is a mandatory complement to chicken fried steak, strongly recommended when making fried chicken and anything else where mashed potatoes is served as a side dish. It's also heavenly spooned over a hot biscuit. And it's not hard to make. This recipe calls for "pan drippings." These can be the drippings left in the pan from making chicken fried steak, fried chicken or fried bacon. If you haven't fried anything, but just want cream gravy, use half canola oil and half butter. After frying your steak or chicken or whatever, drain the drippings from the skillet, leaving in the crusted and browned bits and reserving 2 tablespoons of the drippings. Return the 2 tablespoons of drippings to the skillet, and turn heat to medium-high. Sprinkle the flour into the drippings and stir vigorously with a wooden spoon for about 2 or 3 minutes to "cook" the flour. It will darken in color to a rich brown. You're making a roux. Then, stirring constantly, slowly add the milk, and bring to a boil. Cook, stirring constantly, for 2 to 3 minutes until gravy thickens. (If it gets too thick, thin it with a little milk.) Add salt and pepper to taste. Serve hot.